Brackley Town boss Jon Brady says his side must not get carried away and remain fully focussed on their final two games of the season following Saturday’s stunning 1-0 win over leaders Barrow. Few would have given Saints any chance going into the game given their recent dismal run of form which had yielded just one win in 13 matches, but David Moyo’s spectacular strike 12 minutes from time earned the home side three priceless points in their battle against the drop. The win is not enough to move Brackley out of the relegation zone but they have climbed a place to 20th and with a vital game against already relegated Hyde this weekend, they have given themselves every chance of staying up. Brady said: “To beat the league leaders showed a lot of character. “David Moyo’s goal was outstanding. He deserved it because his work-rate in recent games has been excellent. He has kept believing, working hard and giving everything. “The whole defence was excellent today. They threw their bodies on the line. A determined and spirited Brackley performance earned three precious points in the battle for survival at the bottom. The game was only one minute old when Eric Odhiambo collected an injury that brought Curtis McDonald into first team action for the first time since September. After Barrow’s strong start, Saints settled and more than matched their title-chasing visitors. 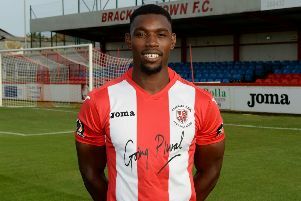 In an even first half, Tom Sharpe’s saving block from Andy Cook was the closest the visitors came while for Brackley Curtis McDonald’s foraging run and pass almost set up David Moyo, who could not connect close to goal. The second period was dominated by the visitors but they could not find the breakthrough as Saints’ defence stood firm. Sam Whittall deflected Lewis Guy’s effort onto the post, Danny Pilkington’s shot was just wide and three times Brackley defenders cleared off the line in a series of goalmouth scrambles as Barrow exerted real pressure. Top scorer Andy Cook’s goal-bound volley was blocked by Saints’ captain Ryan Austin before Brackley struck back. A mazy run by Owen Story saw Moyo fire over on 69 minutes. Then Moyo picked up the ball and, turning away to create space, hit a curling shot from 20 yards that found only the top corner to give Saints a 78th minute lead. The Bluebirds pressed for an equaliser but a resilient Saints held out. Brackley: Snedker, Pierpoint, Fitzsimons, Eddie Odhiambo, Sharpe, Austin, Story, Whittall, Moyo, Kaziboni (Green 82), Eric Odhiambo (McDonald 5).Subs not used: Hammond, Rowe, Farrell. Barrow: McMillan, Cowperthwaithe, McWilliams (Reid 73), Lacey, Livesey, Grand, Ledsham (Pilkington 24), Sheridan, Guy (Walker 67), Cook, Haworth. Subs not used: Carver, Harvey.